Acer and Asus are great on the lines of innovation and low price quality tablets, ultrabooks, and netbooks. At this years Computex Acer and Asus have featured some potentially ground breaking devices. Acer has a history of cheap netbooks and great top line Android tablets with their new Olympic Iconia 500. 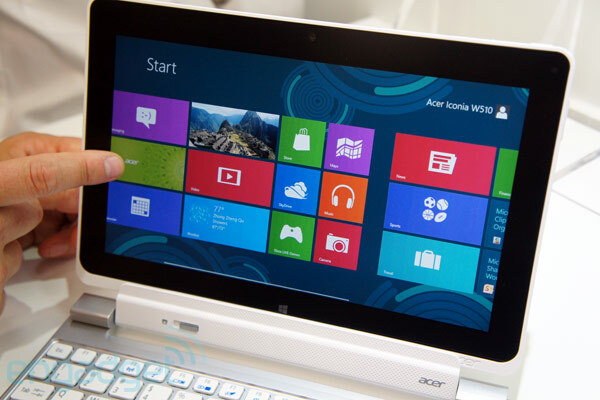 Acer has made a good name in the mobile market most notably for their netbooks and tablets. Asus had a similar fate except they featured the Eee PC line of convertible netbooks which are some of the only of their kind up unto this point. Asus has the most top of the line Android tablet which outweighs the Motorola Xoom and Xyboard and Samsung Galaxy tab series by a mile. The Transformer Prime TF3001 is the latest model to date until the Transformer Pad Infinity comes out in a bit which really proves Android's superior hardware capabilities. These companies are both offering new Windows 8/ RT capable devices with 1366 x 768 minimum screen resolutions (some are higher) and both offer beautiful and in some ways revolutionary designs that really are going to shake up the current market. 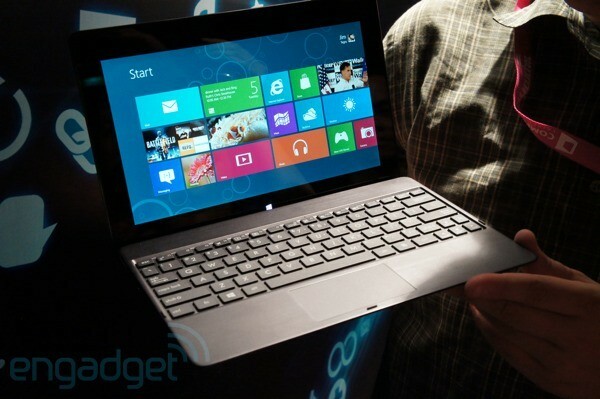 First the Acer lineup courtesy of Engadget who has the best comprehensive coverage on the ground floor. The Acer Aspire series is what I call the worlds "biggest tablet and thinnest all in one" device which truly blows away the I Mac competition. At 27 inches and can be held in your hands it is to me a new concept barring Steve Ballmer's 80 inch in his office. 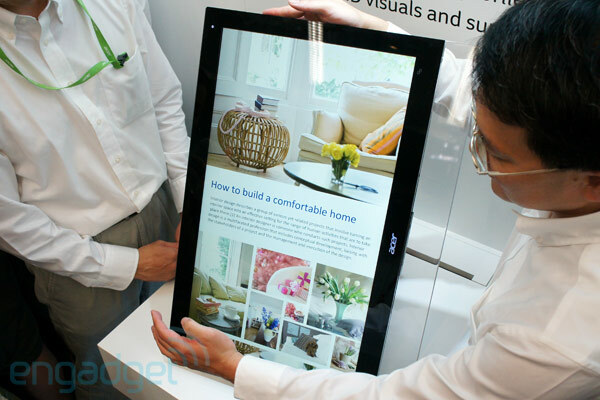 It has a capacitive 64 finger touch screen that can swivel any way you wish. so far Acer has been very mum on the details and will come in a 27 inch and 23 inch flavors. 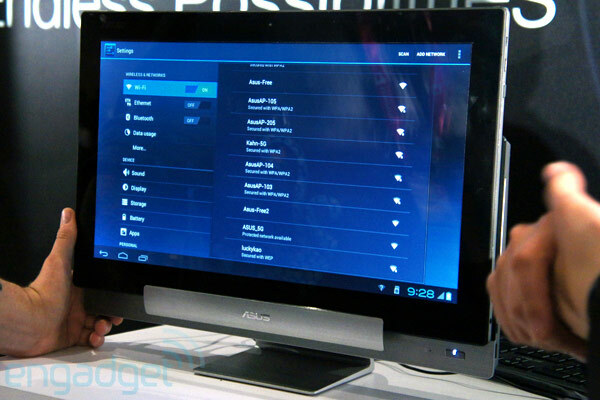 This is the Asus AIO (all in one) which is 18.4 inches and features a nice touchscreen and at first thought was being able to dual boot into Android and Windows but actually Asus called on Bluestacks and has a rooted form of ICS 4.0.3 with a toggle to go back and forth from Windows and "Android." Not much else except you can detach the screen much similar to the Acer model and use it as a 18 inch tablet which is only slightly more practical. Imagine going to work with that under your arm!! 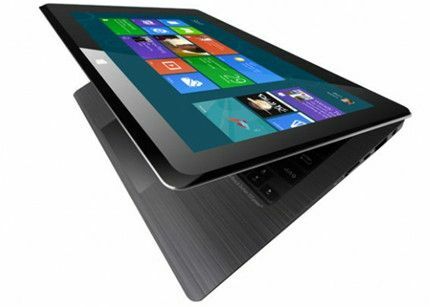 Next up is the Asus 600 and 810 "transformer books'' which are really nice looking Windows 8 running Transformer tablets. Some of the main differences are of course one running Windows RT and one running Windows 8, the RT version is based on the Nvidia Tegra 3 quad core chip which is an excellent choice especially the embedded graphics but has 2 GB of RAM instead of 1 GB so it can run Windows 8, also the screen on the ARM model 600 is of a lower Super IPS ++ 1366 x 768 instead of the 1920 x 768 and the Transformer Pad Infinity is supposed to be of an even higher resolution in the ongoing pixel war between the new Ipad and her competitiors. Mainly the specs are the same both sporting 8mp rear auto focusing cameras and a 2mp up front for HD video chatting. The Intel device runs on the Medfield chip and has an active digitizer layer which allows you to use a pen which is a whole lot more accurate than a regular stylus.